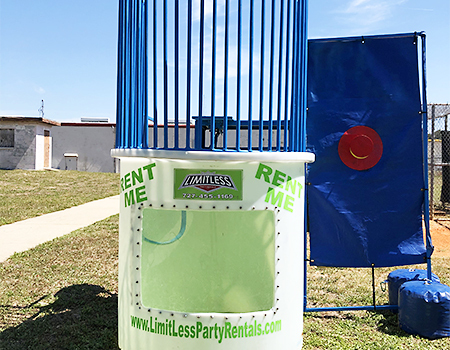 Limitless Party Rentals has everything you need to make your birthday party, family reunion, or corporate event a success! 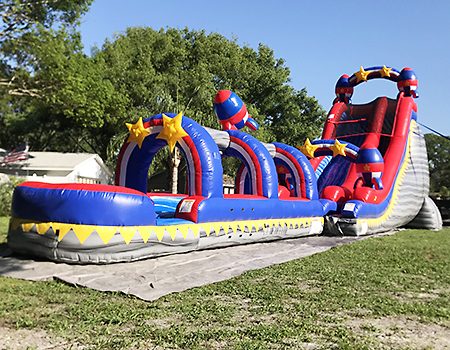 Contact us today at 727-455-1169 to make your next party your best one yet! Price includes FREE OVERNIGHT RENTAL on most units! 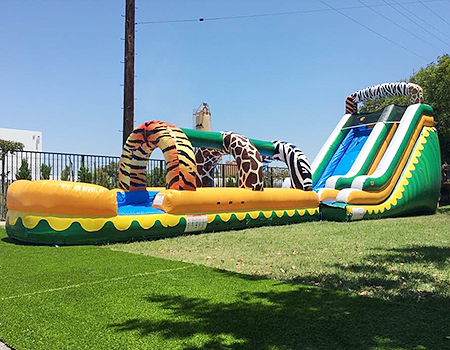 Here's an 18-foot, elephant-sized slide that's zoo-tastic fun! When you get to the bottom, slip-and-slide beneath the animal print arches! 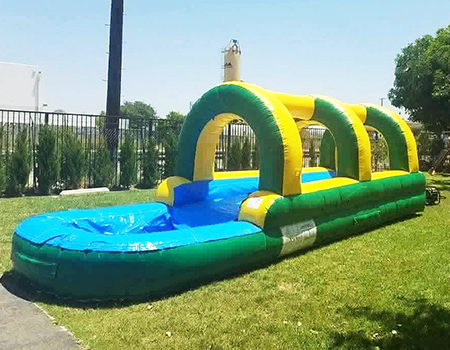 What do you get when you combine a 22-foot giant slide with a totally rad Slip-n-Slide? More wet and wild fun than you can imagine! 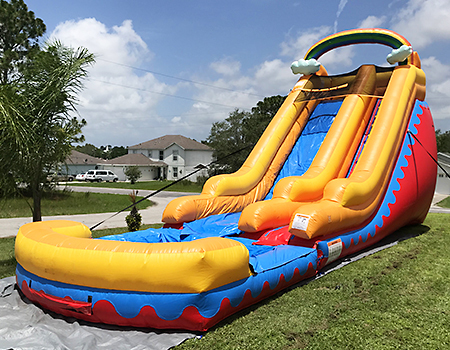 When inflated this slide is a whopping 22 feet tall! It's the biggest and most exciting toy in town! Calling all thrill seekers! This 21 foot slide is not for the faint of heart. 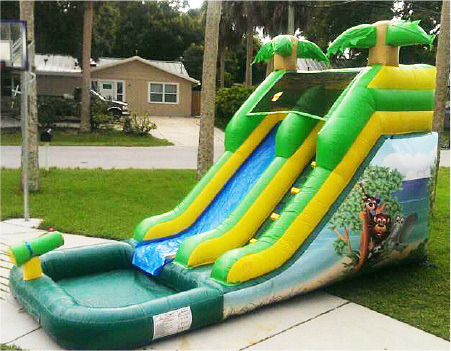 The humongous slide will be the hit of your party. 3... 2.... 1.... Blast off! Zoom down this 24-foot cosmic double bump rocket slide. It's out of this word! Use wet or dry. 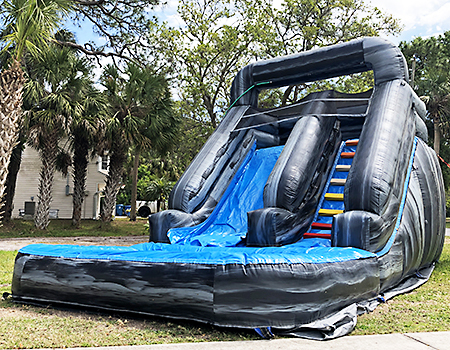 You'll feel like you're blasting off on a rocket as you zoom down the 24-foot double bump slide, into the wet and wild slip n' slide. 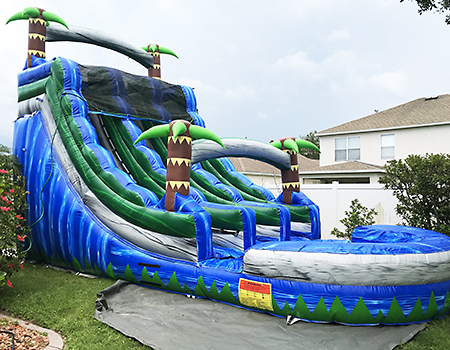 Climb 18 feet into the air and zoom down the wet n' wild waterslide and through the slip n' slide. 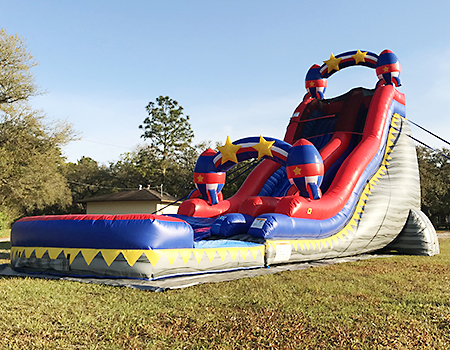 One of our most popular slides, Big Red, is 18 feet tall. 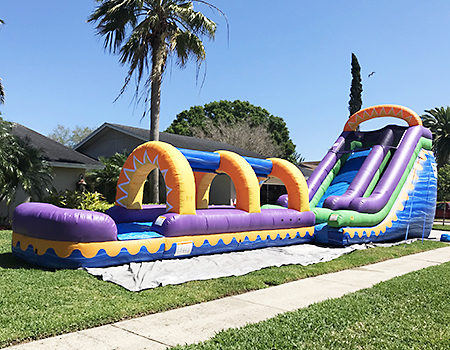 It's sure to be a huge splash at your next party! 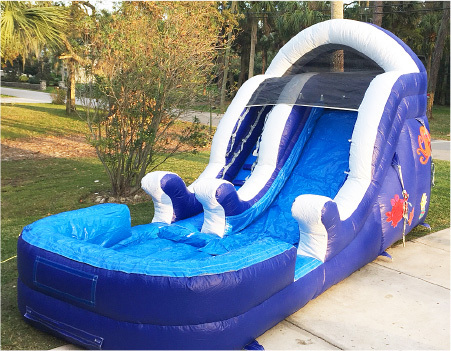 This big blue 15-foot slide has an undersea theme. 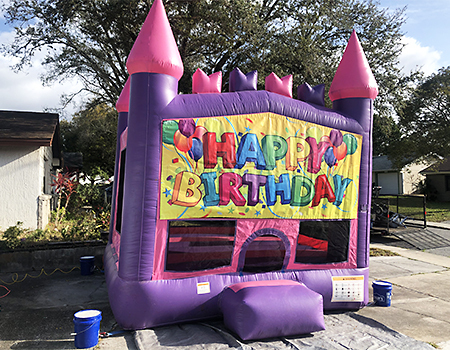 It's one of our most popular units for birthday parties! 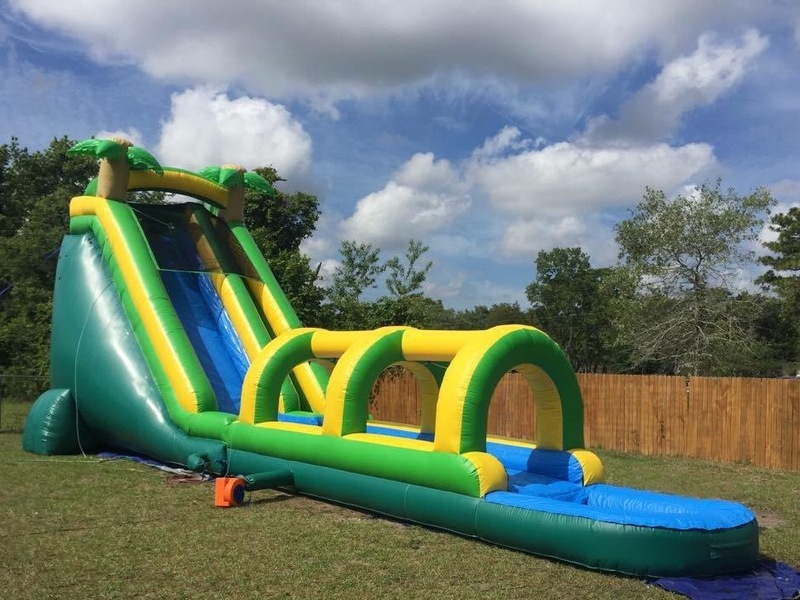 This ginormous 14-foot climbing wall and double slide is always hit with older kids! 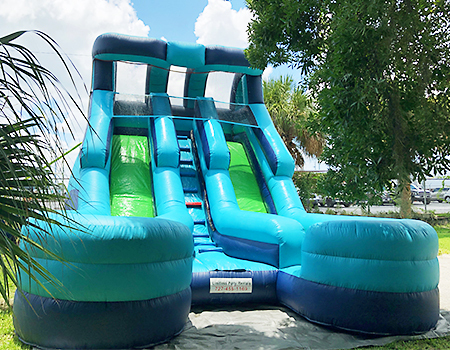 Race against your friends as you coast down the twin 18-foot slides. 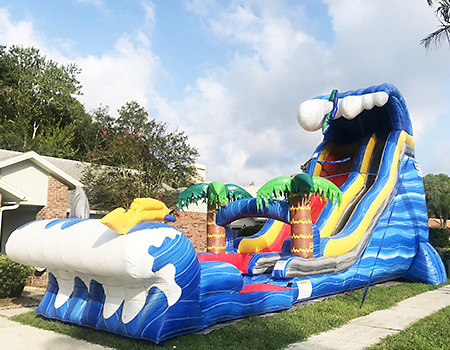 This marvelous blue monster slide is a favorite at outdoor parties. 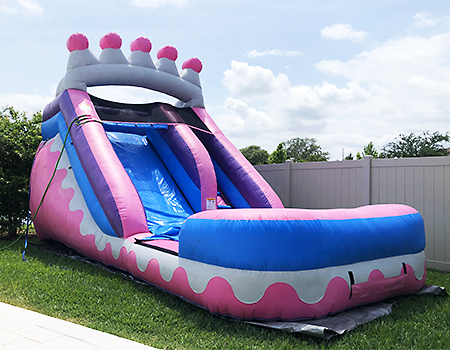 Your pretty princess and her friends will go wild for this 14-foot slide. 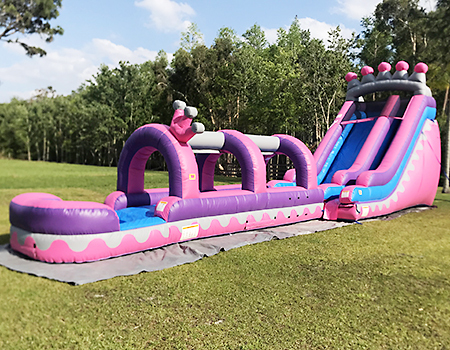 Your little princesses will love climbing to the top of this 18-foot royal slide and splashing their way down through the slip n' slide. 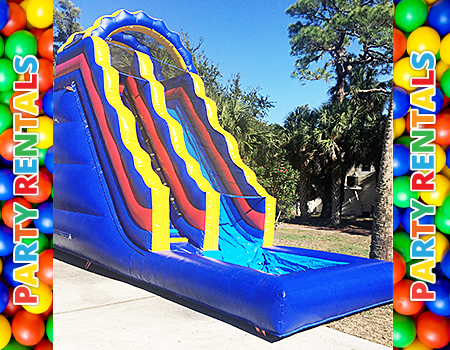 This 14 foot marble slide will rock your party! Surf down this 24 ft double speed bump slide. Can be used wet or dry. Coming Soon! Race on down this 20 ft dual lane slide. Let’s see who can splash to the finish first. Coming Soon! Ahoy Mate! 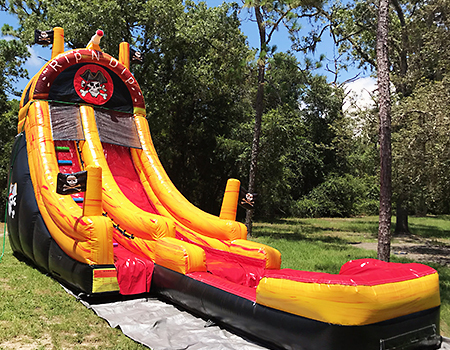 This 18 foot pirate slide is sure to be a big hit at your party. Can be used wet or dry. 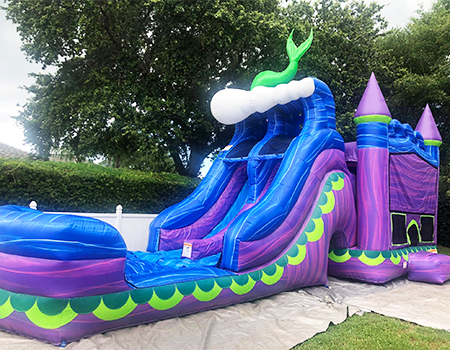 This awesome giant inflatable slide is perfect for a hot, sunny day! There is also an attached slip and slide under a sprinkler for more fun! 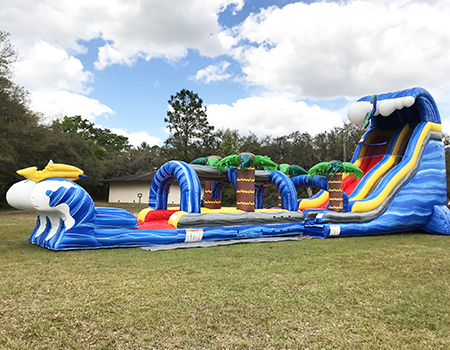 This giant inflatable obstacle course is 45 feet long! 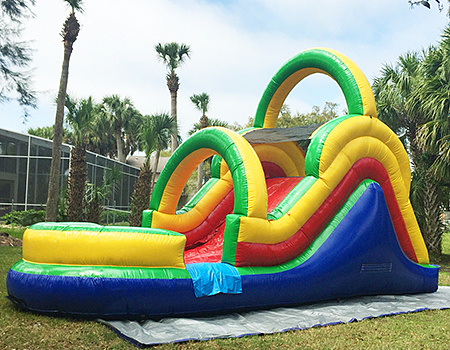 It features an incline plane climber, tunnel crawlers, pillar busters, and a wild slide. Contestants race head-to-head to see who can finish the course first. 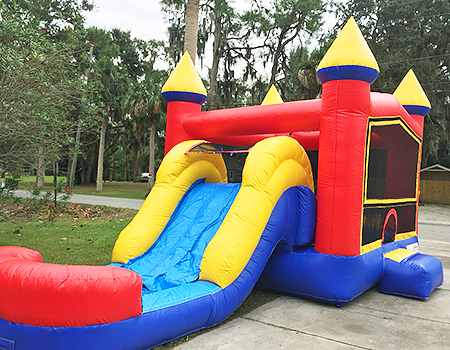 6-in-1 combo: bounce house, climber, slide, basketball net, pillars, & tunnel. Themes: Mickey & Minnie, Frozen, or Little Mermaid. 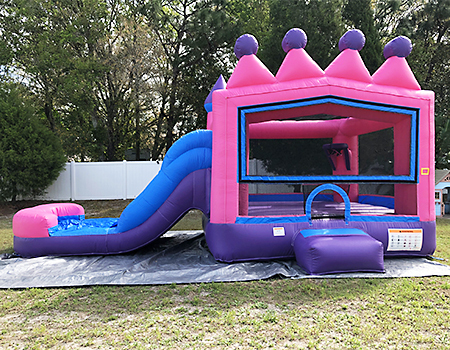 This pretty pink castle can be plain or themed. Available banners: Mickey & Minnie, Little Mermaid, Frozen, Trolls, and Happy Birthday. Rent this castle plain or themed. Available banners: Mickey & Friends, Frozen, Ninja Turtles, Little Mermaid, or Superheroes. 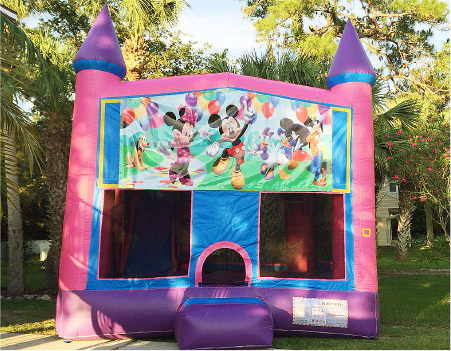 This pink tiara 4-in-1 combo unit has a bounce house, slide, climber, and basketball hoop. Themed banners available for $10. 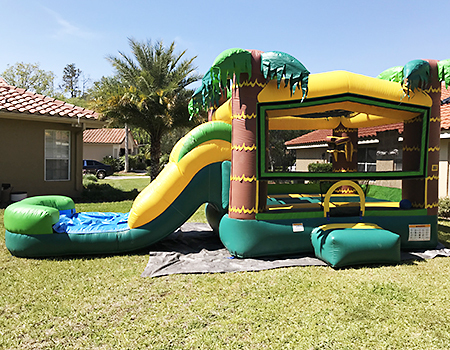 This tropical-themed combo unit has a bounce area, climber, slide and basketball hoop. Themed banners available for $10. 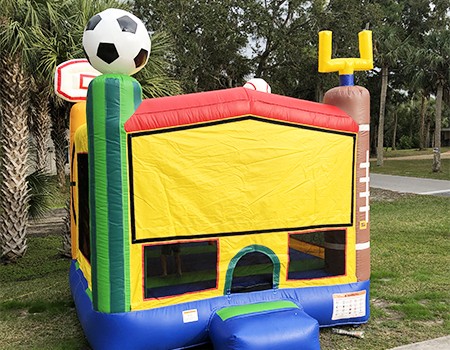 This sports theme castle bounce house can be plain or themed. Available banners: Happy Birthday, Mickey& friends, Super Hero’s , TMNT, Frozen, Little Mermaid or Trolls. Rent this castle plain or themed. Available banners: Mickey & Friends, Frozen, Ninja Turtles, Trolls, or Happy Birthday. 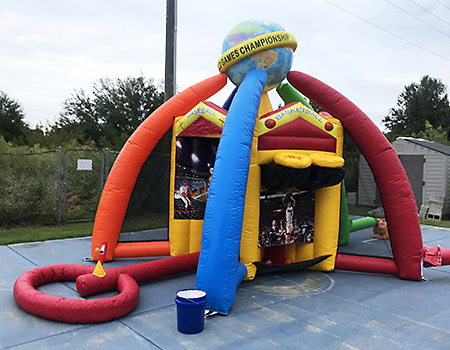 This 4-in-1 combo unit has a bouncy house, climber, slide, and basketball hoop. Themed banners available for $10. 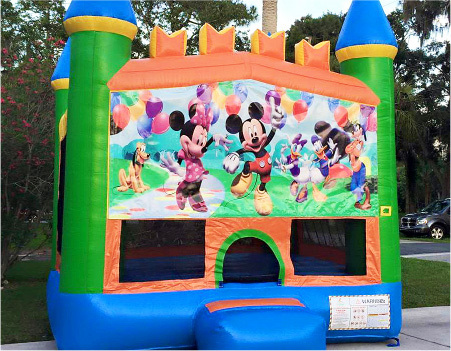 This 5 in 1 combo unit has a bounce house, climber, dual lane slides, basketball hoop and a tunnel. 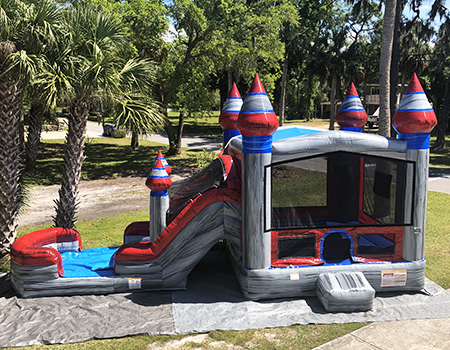 This 5-1 combo unit has a bounce house, climber, dual lane slides, basketball hoop, and a tunnel. This deluxe combo has glittery sparkle vinyl with a mermaid tail! 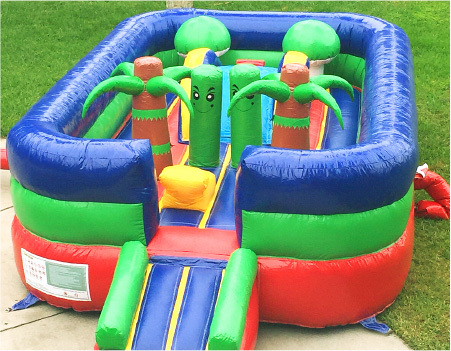 Includes a bounce house, extra large dual lane slides, climber, basketball hoop, tunnel, and obstacle pillars. This is a great fun and refreshing game for all. Just add water. It is also perfect for those guests you were obligated to invite. Coming Soon! 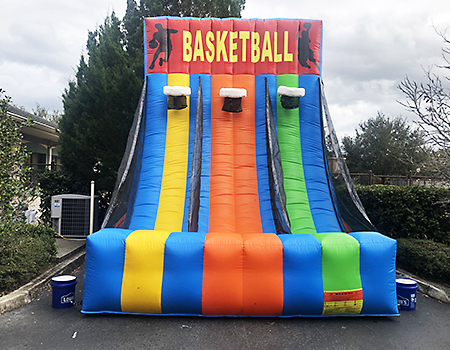 Shoot some hoops with your friends at your next party with our Inflatable Basketball Game! Coming Soon! 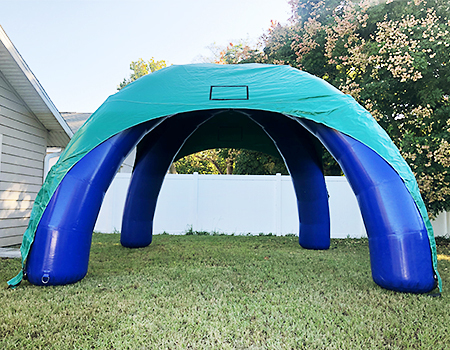 Play soccer, football, baseball, and basketball all on this inflatable sports arena! Coming Soon! 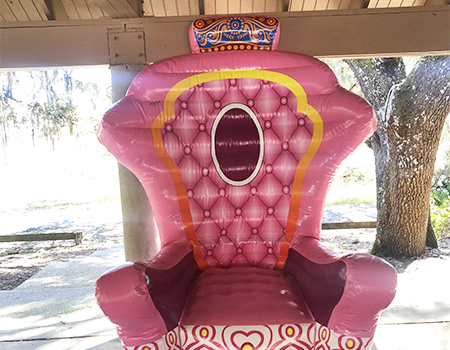 This inflatable Princess Throne Chair will make any birthday girl feel like a real princess! Coming Soon! 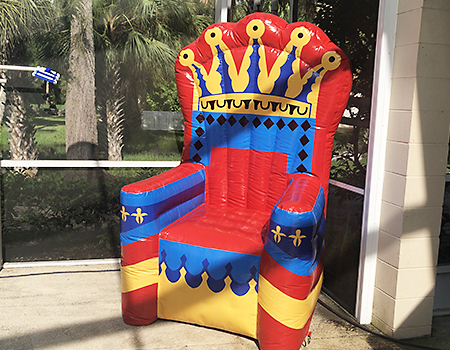 Be the prince of the party and sit on this Royal Prince Throne Chair. 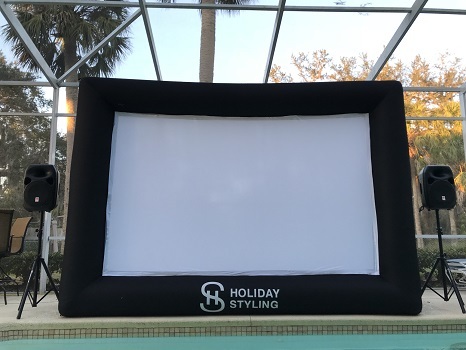 Includes HD projector, Blue Ray DVD player, 16-foot inflatable screen, and amplified 12-inch speakers. 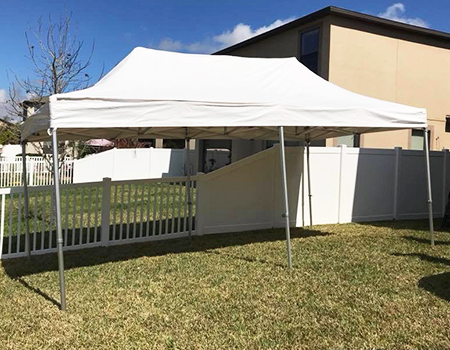 This 10 foot by 20 foot tent will be a great way to provide shade for your next party. 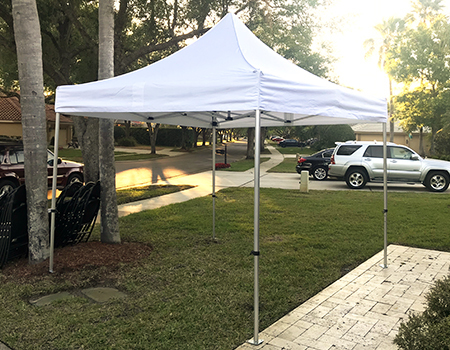 Get some shade with this 10 foot by 10 foot pop-up tent. 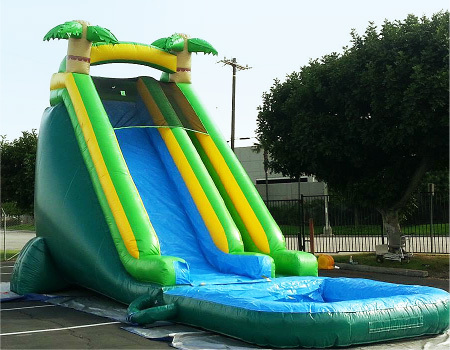 Designed for kids aged 7 and under, this 11-foot tropical-themed slide can be used with or without water. This is our largest toddler unit. 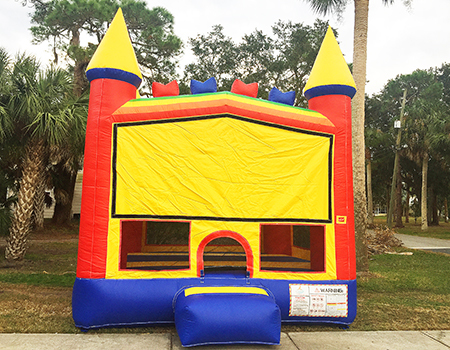 This enclosed unit has lots of room to bounce, play, and slide. 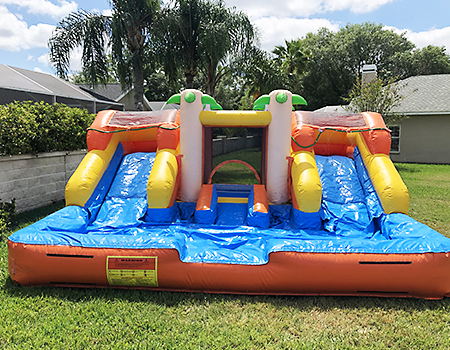 This Kiddie combo has dual slides along with a bounce house. It can be used wet or dry. For children, ages 5 and under. Note: Each food machine comes with enough supplies for 30 servings. 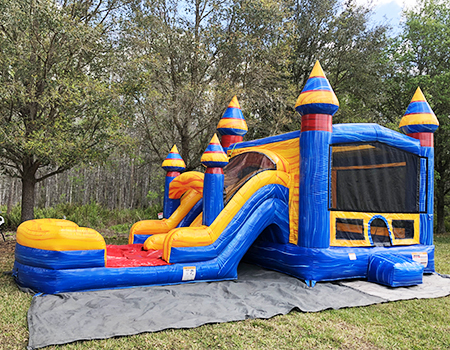 We offer free delivery and set-up to many towns in Pasco County, including Port Richey, Hudson, Holiday, New Port Richey, Palm Harbor, Trinity, Spring Hill, and Tarpon Springs.